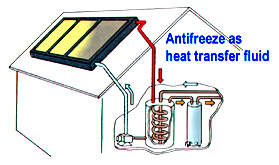 The greatest danger to a solar water heating system is freezing. Even when the air temperature at night is well above 32°F, idle fluid in the collector can freeze, because it radiates heat up to a cold, dark sky. Freezing can be prevented by using antifreeze instead of water as the heat transfer fluid. It circulates in a "closed loop" and transfers heat to the storage tank in a heat-exchanging coil. It is important to use Propylene Glycol rather than Ethylene Glycol and test it every two years. If the exchanger leaks, Ethylene Glycol can be poisonous. It is less likely that the water in a batch water heater would freeze, especially if it has a lid that can be "closed" on cold nights. However, the water in the pipes that connect the batch heater to the "inside" can freeze. Freeze damage can be prevented by using either Polybutylene Pipe, which should not burst when water in it freezes, by wrapping heat tape around metal pipes or by simply draining the system in cold weather.